We started with a continuum. 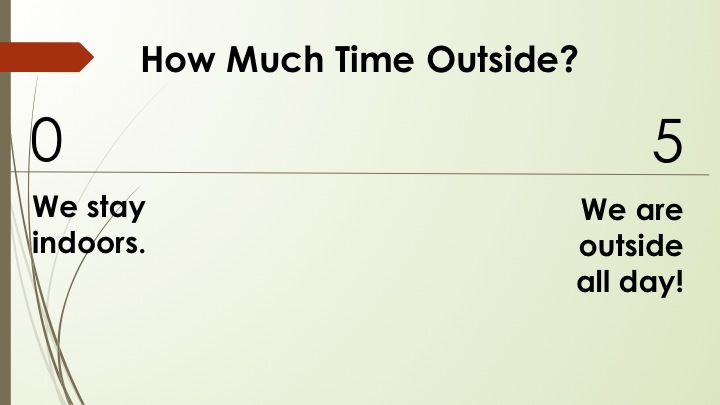 How much time are providers spending outside? 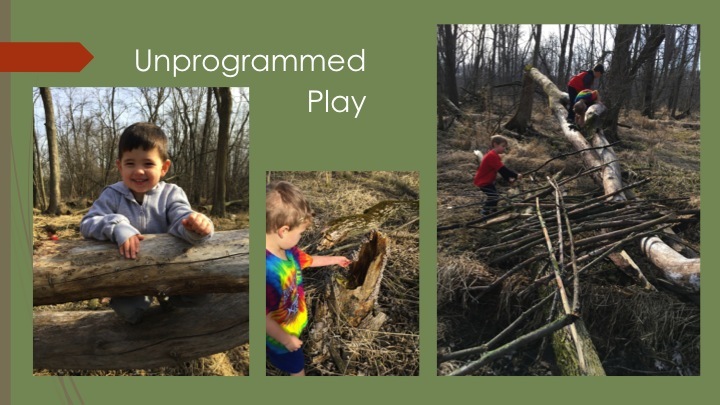 "Natural Play challenges and fascinates children and teaches them about the wonders and intricacies of the natural world while they explore and play within it. 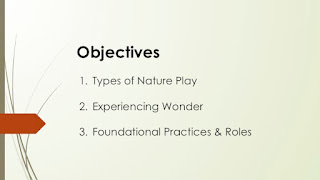 It is intuitive and unstructured, constructive (or deconstructive), and timeless, encouraging interaction with natural materials, features, indigenous vegetation, and creative landforms. 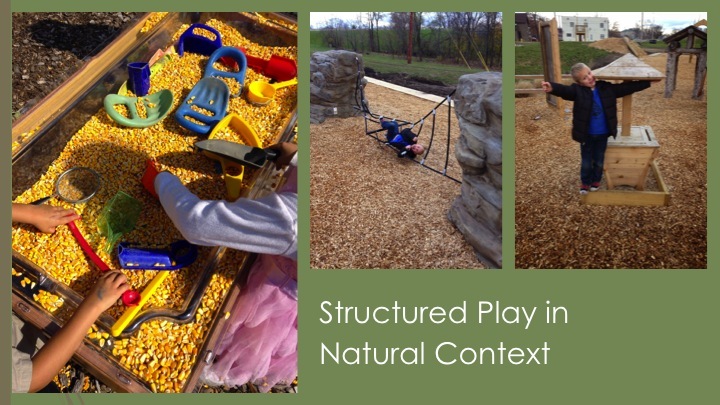 Natural Play is often a blend of materials and experiences to create purposely complex interplays of natural and environmental objects." Think of playgrounds, activities with a specific end. Think of taking advantage of the moment, unexpected natural play, using the landscape as a partner in play. 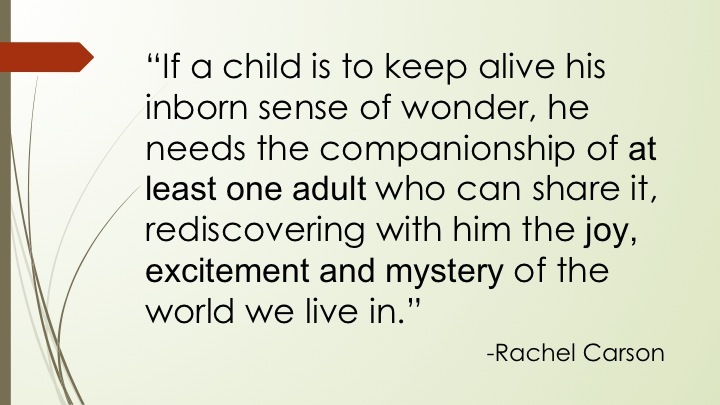 A child is building confidence in being out on their own, taking more risks, and judging safety measures. 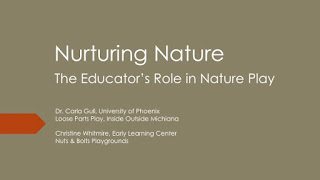 Through informal and more formal education, nature becomes the subject and tool for learning. 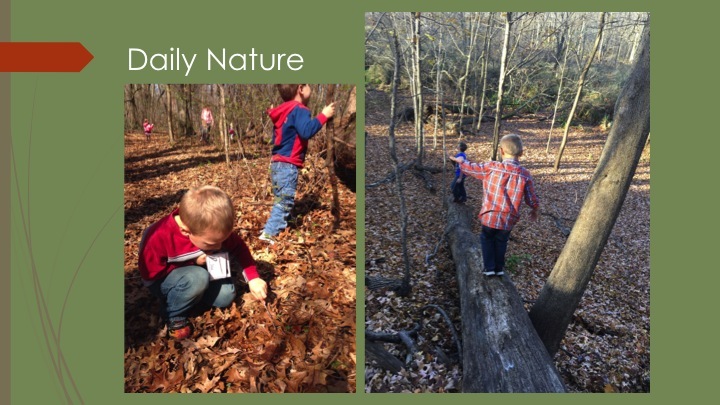 Daily nature includes the general, every day learning that happens in our backyards, while running errands, and by noticing nature around us. 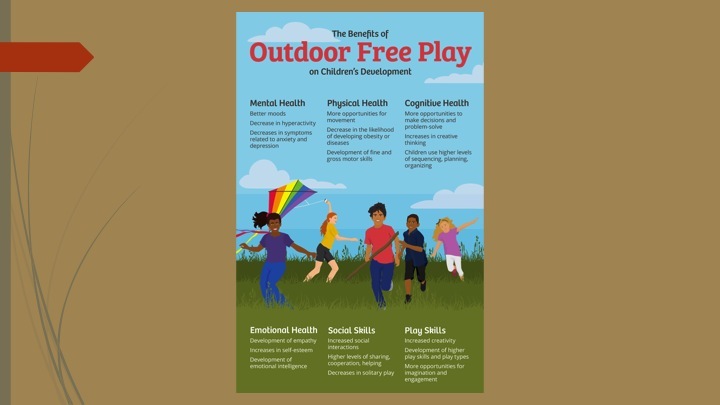 There are many benefits to nature play, or outdoor free play, such as the suggestions listed in this info graphic from Caileigh Flannigan, an outdoor play advocate. 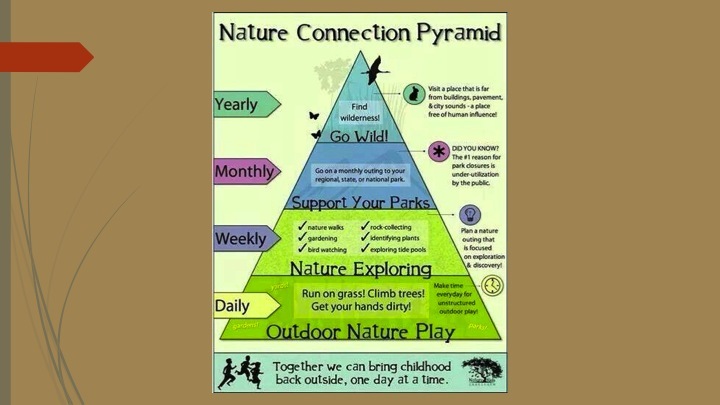 Kenny Balantine from Nature Kids Institute recommends how often we should engage with the wild, advocating for daily outdoor nature play. We also looked at the barriers to nature play and brainstormed ways to get around these for outdoor play, with this infographic about Pathways to Play: Overcoming Nature Play Barriers. 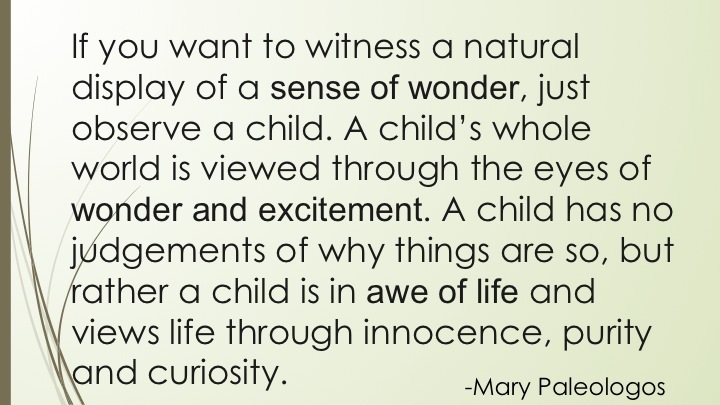 We moved into developing a sense of wonder at this point as we debriefed watching the clip, sharing the following quote by Mary Paleologos. Once again another continuum to help us understand our staff better. 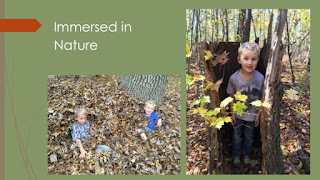 How comfortable do educators feel in facilitating nature play? 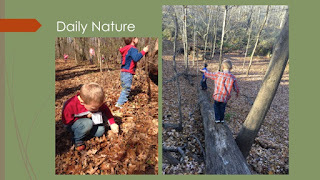 We moved into direct experiences and inquiry based learning as part of nature as an educator. 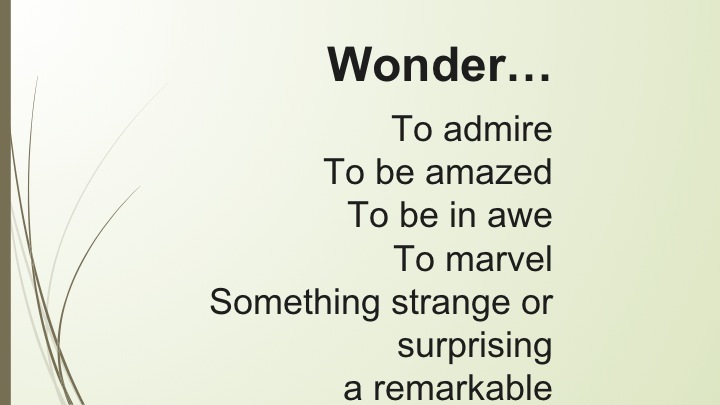 We had an experience to first just describe what we saw in the picture. 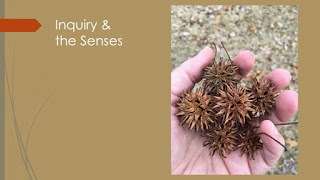 Later we passed sweet gum balls out and investigated them up close! 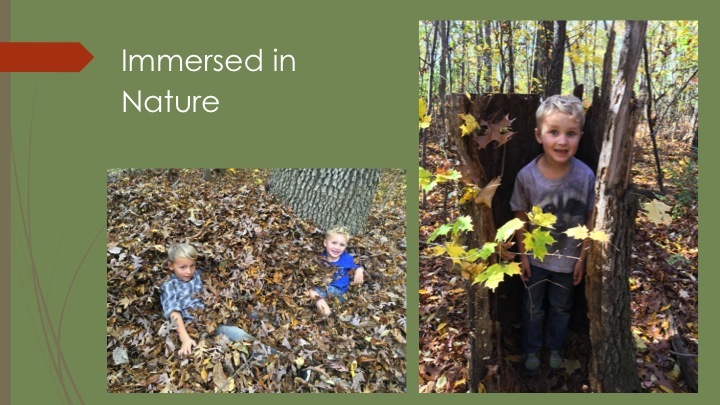 What a richer experience to have real experiences with real nature! 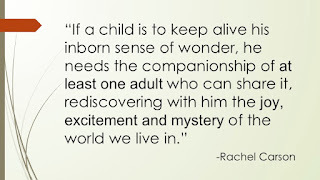 Rachel Carson's Sense of Wonder is a great example of a knowledgable person who could set aside her own agenda in order to explore the natural world to explore nature with her nephew. 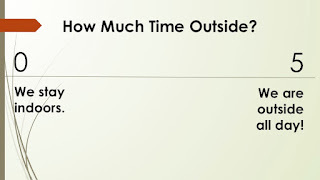 A new version of her book is coming out, though I've also enjoyed the earlier copy. 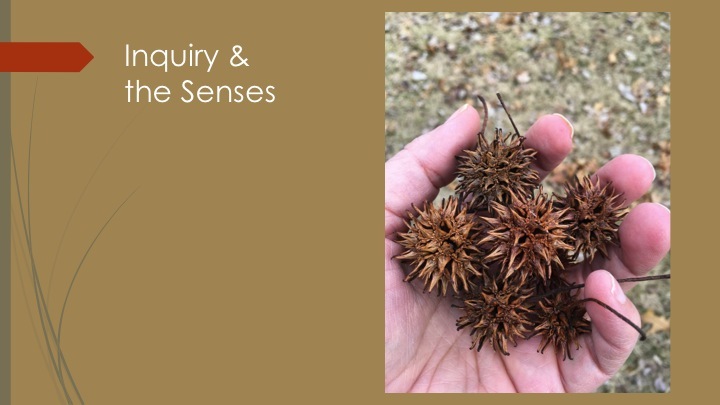 At this point, we watched this video by Eastern Connecticut University on inquiry based nature investigations. 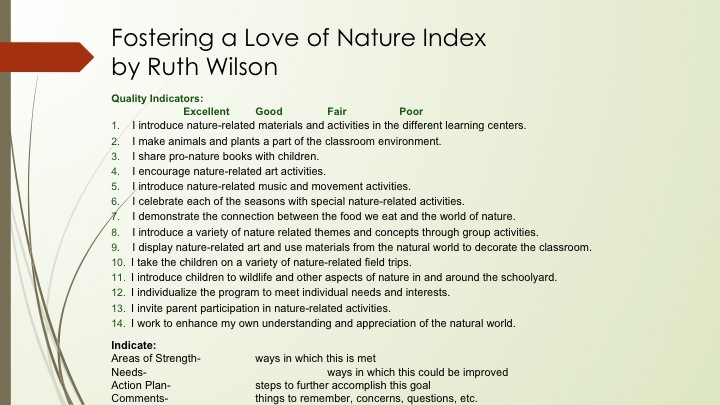 Great modeling as nature as educator. 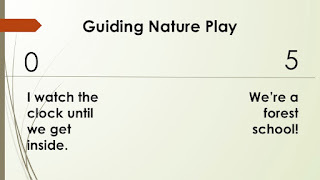 They have a whole archive of good quality videos on outdoor investigations and such. 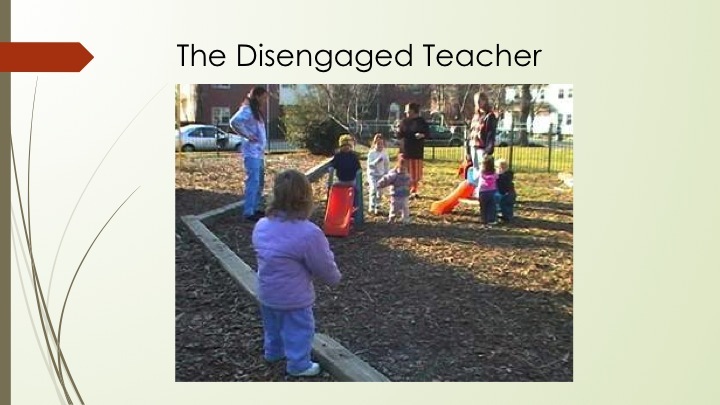 What are the teachers doing in this picture? We all may have been here at one point. 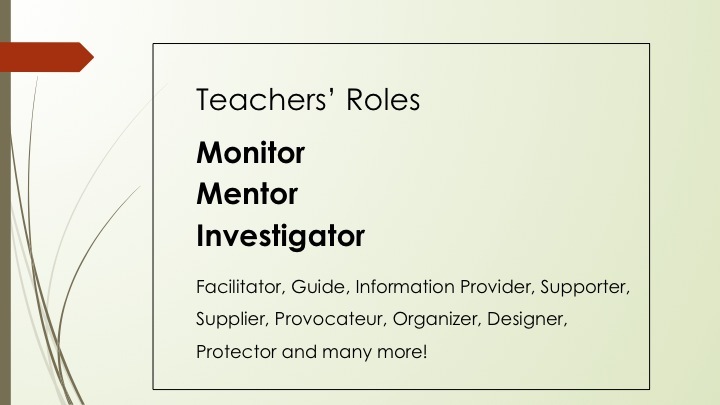 Becoming more engaged through our various roles as educators can yield a more fulfilling experience for us and the children. 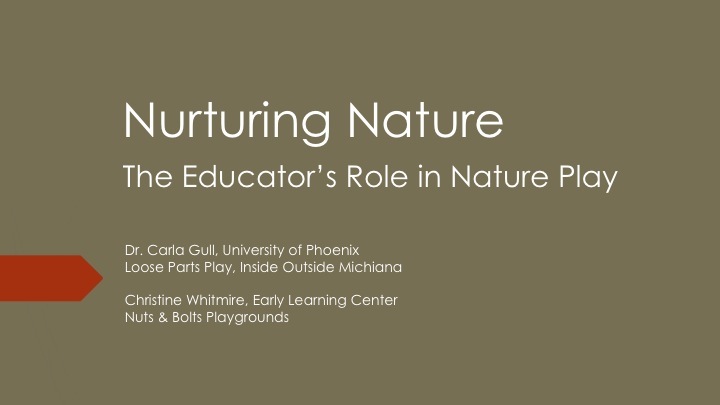 What are the roles of educators in nature play? We have many varied roles that will depend on the type of nature play. 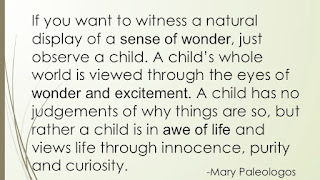 As educators, we are the gatekeepers for children experiencing the outdoors and nature in general. Enhancing our spaces can make a huge impact. 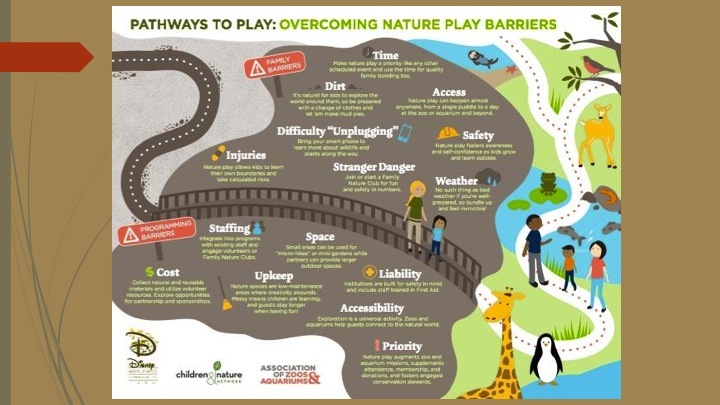 I like the natural playscape or outdoor classroom approach to this, though also promote finding some time with wild nature as well. 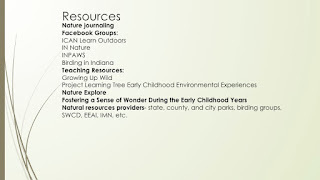 Additionally, having a few tools and resources can really enhance our experience. A first aid kit is usually a basic that we should always have as there is a risk in all our learning. 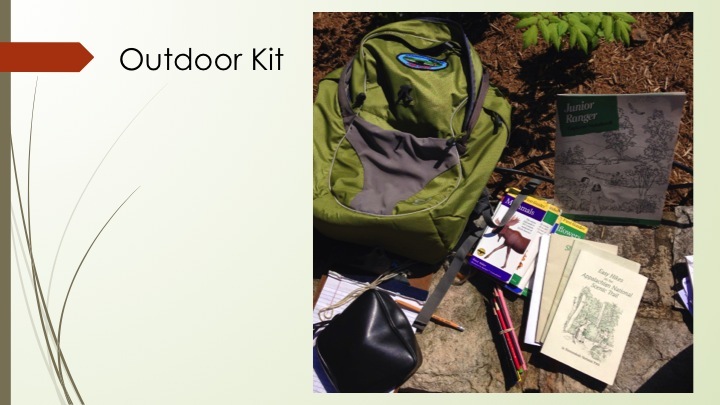 Guide books, magnifying glasses, ideas for nature hikes, marking tools (colored pencils, paper, clipboards, etc. 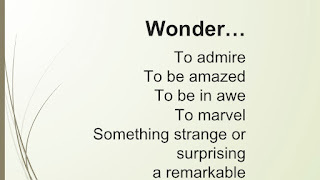 ), and more can quickly add to our experience outside. 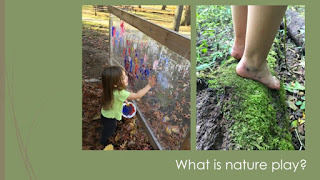 There are many ways to document the learning that happens through nature play. 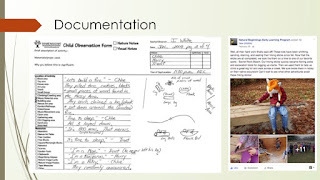 Dimensions Foundation, a partner of Nature Explore, provides training on nature notes, like the example in the left. 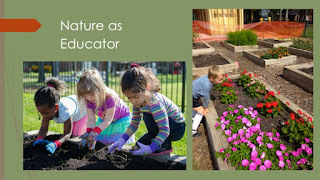 Many use Facebook or other social media posts to detail the learning that is happening like the example on the right from the Natural Beginning Program. 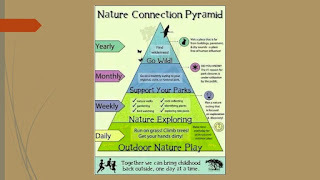 They have a wonderful nature based early childhood program! 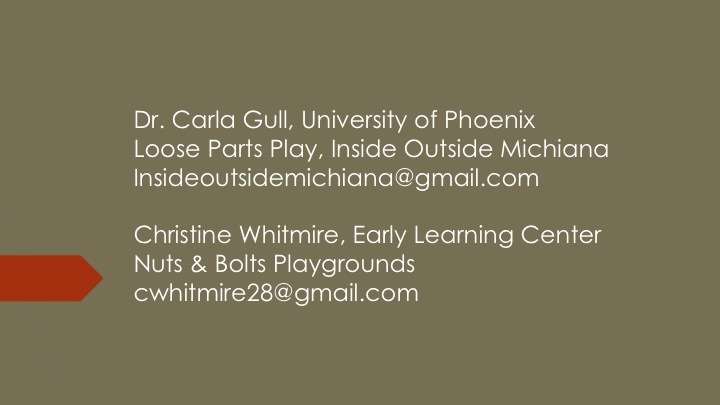 I also will take out a clipboard with labels or sticky notes for notes on individual children that can be transferred to their files later. 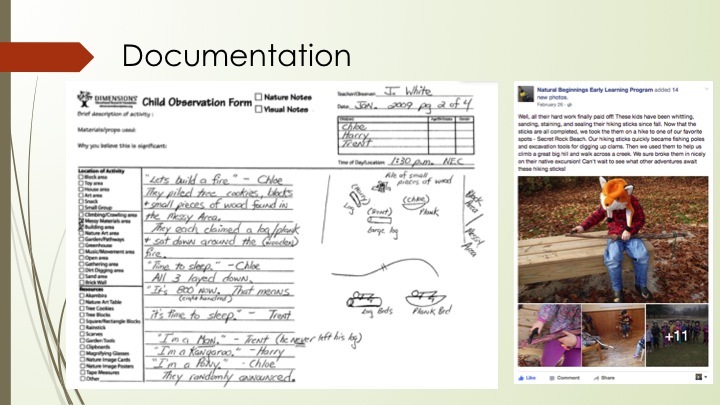 Inquiry based books have observation sheets in the resources often as well. 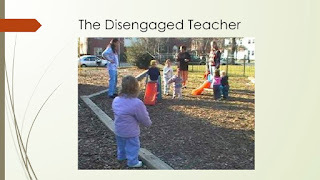 Here is another video that looks at documenting learning. 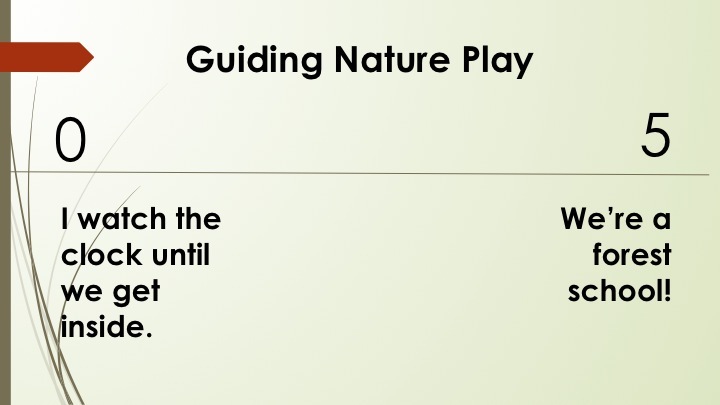 Video and photos can be an important part of this process. 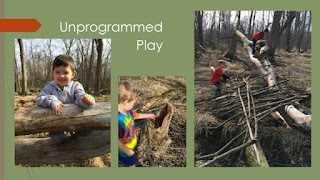 There are more apps moving toward an easier flow for documenting learning in early childhood. Natural resources providers- state, county, and city parks, birding groups, SWCD, EEAI, IMN, etc. 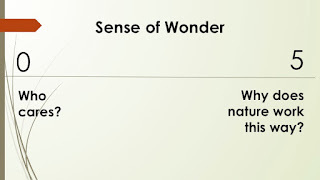 Ruth Wilson really delivered with the Fostering a Sense of Wonder during the Early Childhood Years. 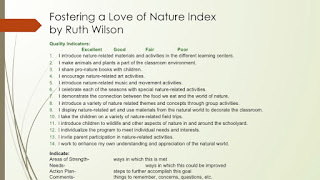 While a bit older of a resource, she has a new book out called, Learning is in Bloom. She is a great inspiration in this field. So great to meet her in person last year! 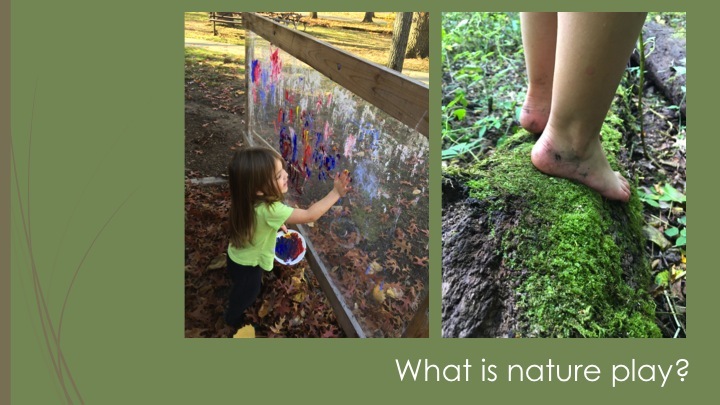 This can be a way to assess where we are in our journey as a classroom to encourage nature play, inquiry, and wonder in early childhood! 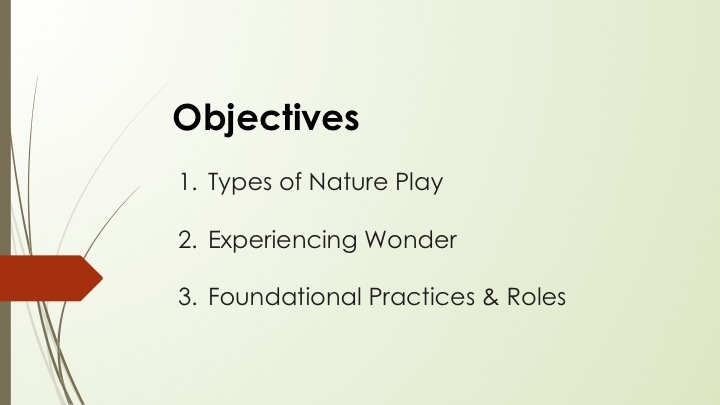 Throughout the presentation we had time to share examples, converse, and work toward inspiring solutions for more nature play! 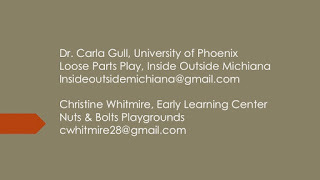 Feel free to contact Chris or myself with any questions or comments.